At a check presentation during the September 20, 2017 board meeting, Superintendent David Healy (left); Board Vice President Lorene Torrone, and Board President Ben Giovine accepted support from Edele Hovnanian in the amount of $255,000. The grant award will help establish a Real Estate Incubator and an Anatomy and Physiology Lab at two of the district's Career Academies. 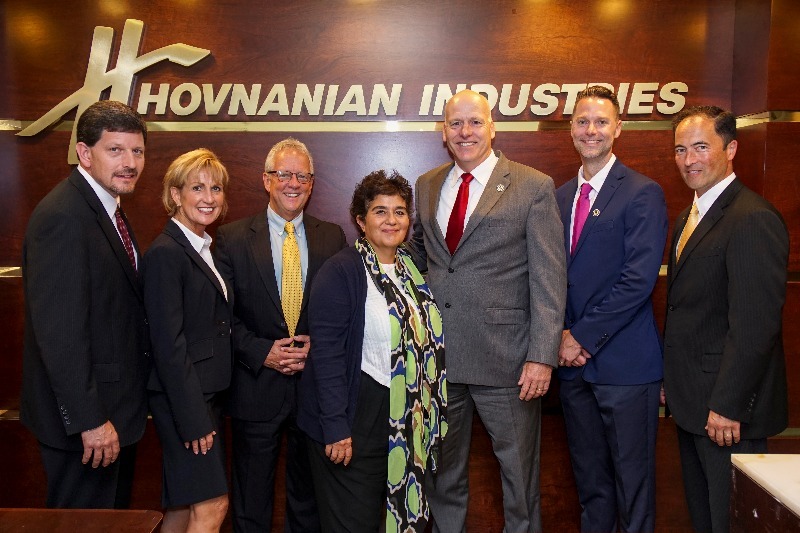 Back in June, Toms River Regional School District administrators joined Edele Hovnanian at the Hirair and Anna Hovnanian Foundation’s offices in Tinton Falls to celebrate their newfound partnership. From left to right: William Doering, business administrator; Debra McKenna, assistant superintendent; John Coleman, assistant superintendent; Edele Hovnanian, director of the Hovnanian Foundation; David Healy, superintendent; Mike Kenny, grant writer; and Marc Natanagara, assistant superintendent. Toms River Regional School District has received grant awards from the Hirair and Anna Hovnanian Foundation in support of two high-impact Career Academy initiatives. Edele Hovnanian heads the foundation established by her parents and which has as part of its core mission the support of health, educational, and charitable programs throughout New Jersey, with a focus on Monmouth and Ocean counties. After reviewing an in-depth and custom proposal that outlined the district’s short- and long-term goals, including its upcoming Career Academies, Hovnanian opted to invest $125k in the district’s Real Estate Incubator and $130k in its Anatomy and Physiology Lab for the 2017-2018 school year. As part of the Business Academy at High School South, the Real Estate Incubator will offer a direct career path, helping students develop a passion for a lucrative, challenging, satisfying, and constantly evolving industry. Students will learn about real estate ethics, listing services, the nature of markets, licenses, mortgages, marketing, contracting fields, and more from qualified teachers and local professionals. The Incubator remains true to the district’s integrated learning philosophy, and blends market science with tech, engineering, art, and math. Students will work with and even create mobile real estate apps, client portfolios, and databases; get introduced to applicable and rewarding trades; and produce 3D home tours, home photography portfolios, and podcasts that cover market trends. The Real Estate Incubator will in turn produce more qualified local real estate professionals and contractors, and more informed future home and business owners. The Anatomy and Physiology Lab will anchor the biomedical strand at the STEAM Academy of High School East. The grant will support a state-of-the-art lab with anatomy models, appropriate technology, digital and physical resources, and science-oriented furniture, to be used by all students in the School of Biomedicine as well as others studying the biological sciences. The Lab and its curriculum are supported by existing and developing district partnerships with local medical institutions such as Hackensack Meridian. Over time, the district will track cohorts of students to see how many enter local medical fields and college programs. College and career readiness define the direction of Toms River Regional Schools in 2017 and beyond, and is an initiative fully supported by its Board of Education. The Hovnanian Foundation grants address a number of Board-approved district goals including student achievement, budget, and facilities. Both the school district and the Hirair and Anna Hovnanian Foundation envision these awards as the beginning of a longstanding relationship. Successful implementation of these programs at their respective academies in 2017-2018 may lead to their establishment at each high school in the coming years. Toms River Schools’ long-term goal is to host all three Career Academies at each high school. “There are so many kids who graduate college and say, ‘Now what?’” said Edele Hovnanian. “I think the earlier you start figuring out what you want you do, the better chance you have to be successful. Our students need real-world, legitimate options.” The philanthropist and foundation director acknowledged that the district’s efforts in innovation helped earn her investment. “Others need to start looking at the ingenuity of what Toms River is doing,” Hovnanian said. Support from the Hirair and Anna Hovnanian Foundation highlights the notable impact of grant funding on the district. As the 2016-2017 school comes to a close, Toms River Regional Schools has been awarded nearly $625K in federal, state, and private funding that supports a wide array of Board-approved goals and district initiatives including literacy, transportation, arts-integration, active learning, environmental science, and college and career readiness. The mission of The Hirair and Anna Hovnanian Foundation is to provide funding for charitable, educational, religious, scientific, literary or testing for public safety purposes, with a primary focus on providing such funding so as to assist Armenian communities worldwide. The Foundation assists charitable or educational organizations located in Ocean or Monmouth Counties, New Jersey whose primary activities include provision of healthcare or education and training in real estate development. For more information, visit http://www.hovnanianfoundation.am/. For more information on grants and partnerships, please contact Mike Kenny at mkenny@trschools.com or 732-505-5539. For more information on Career Academy and innovation initiatives, contact Marc Natanagara at mnatanagara@trschools.com.